Samuel Ward was one of Rhode Island’s delegates to the First Continental Congress in 1774. There he met John Dickinson of Pennsylvania, Richard Henry Lee of Virginia, and other men pushing for a united opposition to the London government’s strictures on Massachusetts. On 19 Oct 1774, the Earl of Dartmouth, Secretary of State for North America, sent a letter to all the colonial governors reporting that the privy council had barred the export of gunpowder and arms to the colonies. In most colonies the governors were royal appointees, and Ward appears to have assumed they’d keep this news to themselves. In Rhode Island and Connecticut, however, the governors were elected by the colonial legislature, and Gov. Joseph Wanton had shared the letter with his fellow politicians. As it is of the greatest Importance that every Colony should have the earliest Notice of the hostile Intentions of Administration I have enclosed You Copies of Lord Dartmouths Letter & the Order received with it. Our Genl. Assembly immediately ordered Copies of them to be sent to Mr. [Thomas] Cushing to be communicated to the [Massachusetts] provincial Congress. They then ordered the Cannon at [Newport’s] Fort George (which was not tenable) to be sent to Providence where they will be safe and ready for Service, 200 bbls. of Powder, a proportionate quantity of Lead & Flints & several Pieces of brass Cannon for the Artillery Compy. were order’d to be purchased, a Major General (an officer never before chosen in the Colony) was appointed, several independent Companies of light Infantry Fusiliers, Hunters &c were formed, the Militia was order’d to be disciplined & the Commanding Officers empowered to march the Troops to the Assistance of any Sister Colony. The Spirit & Ardor with which all this was done gave Me ineffable Pleasure and I heartily wish that the other Colonies may proceed in the same spirited Manner for I fear the last Appeal to Heaven must now be made & if We are unprepared We must be undone. The Idea of taking up Arms against Great Britain is shocking but if We must become Slaves or fly to Arms I shall not hesitate one Moment which to chuse for all the Horrors of civil War & even Death itself in every Shape is infinitely prefarable to Slavery which in one Word comprehends every Species of Distress Misery Infamy & Ruin. 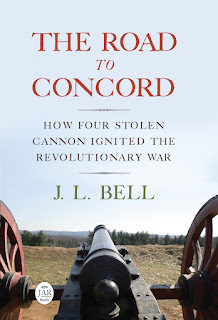 Moving cannon to a more secure place, buying weaponry when the London government had just forbade that export, appointing a major general and forming new militia companies, invoking John Locke’s “Appeal to Heaven”—Ward’s Rhode Island was clearly preparing for war in December 1774.